House prices remained relatively resilient in 2018, despite anxiety about Brexit and concerns about affordability. While property prices were relatively flat in 2018, some regions did perform better than anticipated. On the whole the average British property’s value increased by £2,860 in 2018, or £8 a day according to property website Zoopla, a rise of just 1.02 per cent. Affordability levels remain attractive in many areas outside of southern England and locations, such as the Midlands and northern cities saw strong property inflation. The best performing English region was the East Midlands, where prices rose by 2.91 per cent to an average of £220,746. Conversely London and the South East reported stagnant or falling markets. London saw property values drop 1.67 per cent to an average of £653,587 this year, according to Zoopla. Meanwhile, the East of England saw a 0.5 per cent fall to £357,952, but the South East and South West both saw 0.38 per cent rises to £409,923 and £307,693, respectively. In Scotland, property values rose by 6.43 per cent, while in Wales they climbed 3.98 per cent, but in England gains were a marginal 0.58 per cent. How will what we know change post Brexit? The market predictions for the situation post Brexit are many and varied. While nobody knows the impact it will have here are some suggested outcomes. 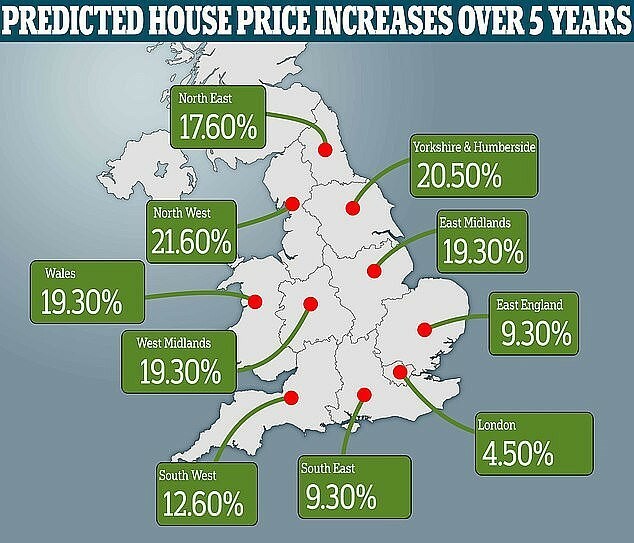 Rics estimates that prices will rise by one per cent in 2019, although surveyors believe that uncertainty about Brexit is likely to hit the UK housing market well into next year. The group is expecting the number of homes being sold, as well as the prices that they are being sold for, to edge down over the next three months. Residential properties are taking an average of four months to sell, the longest period since records began in 2016. “It is evident from the feedback to the latest Rics survey that the ongoing uncertainties surrounding how the Brexit process plays out is taking its toll on the housing market,” said Rics’ chief economist, Simon Rubinsohn. In CBRE’s predictions for the coming years, London house prices are set to be flat in 2019, but picking up by 1.6 per cent in 2020 and by 3.5 per cent in 2021. Between 2019 and 2023, the realestate adviser is expecting growth of roughly 10.5 per cent in the capital’s house prices. Savills says that it is affordability, rather than Brexit, which is the major factor for the UK housing market. The property giant is forecasting that UK house prices will rise 14.8 per cent from 2019-2023, although there will be significant regional variation. While London is projected to see growth of 4.5 per cent over this period, it will dip by two per cent in 2019, while the north west is expected to see a 21.6 per cent rise over the period. London’s prime market will also see double digit growth at 12.4 per cent. Whatever the outcome of Brexit on the market, the fact that house purchase approvals were up in December maybe suggests that people are planning ahead and making their move before the March deadline. Springtide Capital Limited is authorised and regulated by the Financial Conduct Authority. There may be a fee for mortgage advice. The precise amount will depend upon your circumstances and loan amount. The FCA does not regulate most buy-to-let, second charge or commercial mortgages. The Financial Ombudsman Service is available at www.financial-ombudsman.org.uk or by contacting them on 0800 023 4 567. YOUR HOME MAY BE REPOSSESSED IF YOU DO NOT KEEP UP REPAYMENTS ON YOUR MORTGAGE.